This week I discuss the latest privacy news and threats including the new Apple credit card, more spy cameras in hotels & Airbnbs, another family tracking DB leak, and how to make $122M sending out bogus invoices. Plus, an “Offense/Defense” style of the OSINT section returns with nextdoor.com. Finally, Listener questions tackle Walmart surveillance video and the removal of sponsors for the show. Show notes at: https://inteltechniques.com/blog/2019/03/29/the-privacy-security-osint-show-episode-117/ Support for this show comes directly from the IntelTechniques online OSINT & Privacy video training. We now have over 85 hours of content, with more added every month. Today, I posted the video from yesterday’s webinar about email address investigations. Listeners of this show always receive a 25% discount at https://inteltechniques.com/25. This week I discuss easy ways to test your VPN, DNS, Browsers, extensions, and custom settings. I also revisit canary tokens as a test of your potential exposure. All episodes and show notes can be found at https://inteltechniques.com/podcast.html. This week I attempt to answer the most common questions sent from listeners over the past month. Sponsored this week by @silentpocket & @Authentic8. All episodes available at IntelTechniques.com. This week I discuss creepy new sextortion attacks, interview SpyCloud about data breaches, and review Authentic8's investigation browser. This week I present new privacy threats, talk about secure cloud storage with SpiderOak, throw out a new Offense/Defense to consider, and make a couple of phone calls to tackle listener questions. This week I talk with the CEO from Fastmail about making email more secure, plus an extended OSINT segment on using data leaks from Dehashed.com combined with public hash data to identify new targets of investigations. This week I interview Bruce Schneier about his new book and our privacy strategies. This week I take random calls live and discuss the topics on listeners' minds. 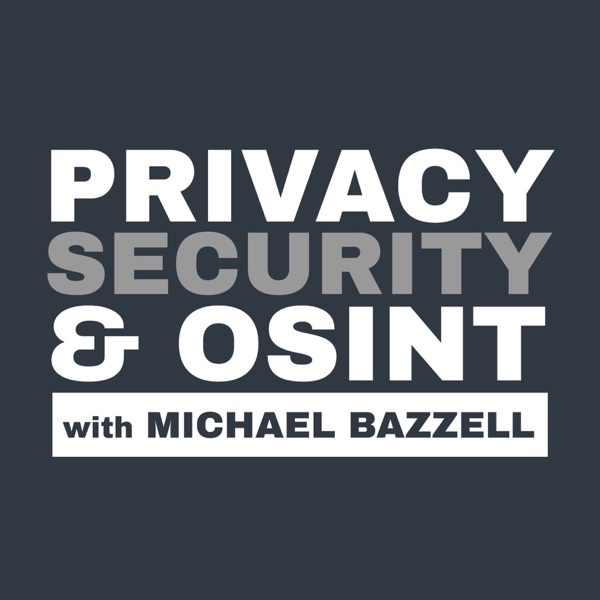 This week Justin Seitz joins me to talk about the impact of OSINT on privacy. This week we talk with a group of singles about being private while dating online. This week we discuss a potential iOS vulnerability, embedded malware packages, software choice considerations, and new listener questions. This week we talk about the encryption fails for Paul Manafort and Michael Cohen. This week we talk about Firefox privacy extensions, Apple security changes, Copperhead OS, PIA logs, Wire support, and our new book. This week we discuss RFID blocking, catch up with Jesse and Cameron on their road to nomad life, explain Tinder offense and defense, and answer listener questions. This week we talk about third parties buying cell location data, EFail hype, GDPR notices, DNA collection at birth, mic blocker fails, a new opt-out workbook, Offense/Defense, and your listener questions. This week we talk with CryptoTrust founder Tim Steiner about the OnlyKey USB device. This week, Aaron Frankel from In The Rabbit Hole joins us to explain his experiences while moving his business away from Facebook. This week we discuss Facebook's latest privacy issues, Microsoft censoring your communication, Google tracking, the latest Offense/Defense, and listener questions. This week we wrap up our Linux transition with our guest David Westcott, sponsored by System76.com. This week we continue our conversation about switching to Linux, sponsored by System76.com. This week we talk with Nextcloud about secure storage, calendars, notes, and more. This week we continue our transition to 100% Linux by discussing considerations for choosing the most appropriate operating system. 067-Sudden Wealth, What If You Won The Lottery? This week Jason co-hosts with Michael to discuss trusts, employment privacy, and DNA testing. This week we talk about Standard Notes, present a new Offense/Defense, and answer your listener questions. This week we talk with Randy Hughes about using land trusts for privacy when owning a home. This week we sit down with Sri and Jeremy from System76 to discuss their line of computers, disabling Intel's built-in "spyware", and other privacy options to consider with Linux machines. This week Michael returns to talk browsers and we answer many of our listener questions that have piled up. Offense/Defense returns and we explain how your VOIP provider can be determined during your outgoing calls. This week's episode is sponsored by Privacy.com. This week Drew and I dive into the basics of Wi-Fi security: locking down your home network, setting up your device, and best practices for untrusted networks. This week Jesse and I discuss the very basic but critical topic of usernames, passwords, and password managers. This week co-host Jason and I discuss protecting your childrens' privacy against Google, Facebook...and their schools. This week we sit down with Drew, Jason, and Jesse for a round-table discussion of privacy and security issues. This week we talk with Brent from Protectli about the importance of a secure firewall to protect our home networks. This week we bring Jesse and Cameron back to discuss their radical new privacy strategy. This week we talk with Puri.sm Founder and CEO Todd Weaver about Open-Source hardware. We both learned a lot in this episode and encourage everyone to digest the content of this interview. Puri.sm may be a big game changer in how we choose hardware from now on. This week we continue our discussion about privacy and security considerations for Windows users. This week we talk with Jonathan White about the KeepassXC Password Manager, tackle listener questions, and provide a new OSINT resource. This week, we talk with Colin Childs from the Tor Project, answer your questions from last week’s cell phone episode, and present a new OSINT technique for telephone number search. This week, "Jason" gives us tips for applying privacy strategies while maintaining a family and normal life. This week, Josh Huff stops in to talk about the data left behind on our phones. This week Andy Yen stops by to talk about the new release of ProtonVPN. This week we talk with Alan Duric, CEO of the encrypted communications app Wire. We also tackle listener questions and offer a new OSINT tip. This week we explain in detail how we use Sudo as part of our daily privacy strategies. This week we discus strategies for making anonymous purchases online and in person. This week we meet up in person to discuss the past three weeks of Privacy and Security issues. This week we try to clear out the inbox of questions and complaints received from listeners. This week, we talk with Aaron Zar, the founder and CEO of Silent Pocket, about everything related to Faraday bags. Plus, we whine more about Chrome, answer your listener questions, and offer a new technique in the OSINT segment. This week, we talk with "HumanHacker" Chris Hadnagy about the aspects of social engineering regarding privacy and security. Plus, we answer listener questions and a present a new investigation technique in the OSINT segment. This week, we talk with M. A. Drew about his path to complete privacy & security. Plus, we answer listener questions and a present a new investigation technique in the OSINT segment. This week, we catch you up on Justin's 30 Day Security Challenge and David Westcott joins us to talk about the Buscador Linux build. Plus, we discuss web browsers, answer listener questions, and a present a new investigation technique in the OSINT segment. This week "Benjamin" stops by to explain how he went off-radar, listener questions, plus an OSINT segment on retrieving deleted Tweets. This special edition confronts the latest CIA Leaks that have generated a lot of interest this week. This week, we discuss our thoughts on Android vs iOS, and the privacy/security issues with each. This week, we discuss how we use YubiKeys as part of our daily digital security routine. We also welcome Yubico as our first sponsor. This week we chat with a representative from Private Internet Access (PIA) to discuss VPNs. This week we tackle another round of listener questions about digital privacy and security. This week we sit down with ProtonMail CEO Andy Yen to discuss secure email communications. This week, we meet up at Sudo headquarters in Salt Lake City to catch up on the latest privacy threats. This week we talk with the CEO of Privacy.com Bo Jiang about masked purchases. This week we sit down with J.J. Luna, the original godfather of privacy. This week, we sit down with co-founder and CTO of the online privacy company Abine (maker of Blur) to talk about privacy masking. This week, we tackle more listener questions about all things related to privacy and digital security. This week we sit down with Sudo CEO Steve Shillingford to talk about their new privacy app. This week, we tackle several listener questions that have been piling up in our inboxes. This week we "Talk" with That One Privacy Guy. This week, we tackle important backup strategies. In this episode, we discuss our recommended Email strategies for Privacy & Security. We discuss the extra costs often related to living a private and secure life. Sometimes, free options come at an unknown cost. In this episode, we discuss our recommended OSINT strategies for Privacy & Security. In this episode, we discuss our recommended privacy and security software and settings for Mac computers. Episode 003 interviews two friends of ours about properly proposing privacy changes to an unwilling significant other. Episode 2 of The Complete Privacy & Security Podcast. We continue our updates from the book and discuss the differences in TrueCrypt vs. VeraCrypt.